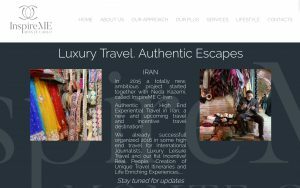 Ciran started an ambitious project together with Miek Egberts, called InspireME C-Iran- Experiential Travel and Incentives. Its aim is to put Iran also on the map for high end, unique luxury leisure travel programs, incentives and MICE ( Meetings, Incentives, Conferences and Events). Giving a real insiders view of the real Iran, encounters with locals, exclusive openings and unique experiences …..